One man, one voyage, one book ignited a controversy that still rages today. This Australian-made documentary revisits Charles Darwin's famous voyage on the Beagle 2009 commemorates 200 years since the birth of naturalist Charles Darwin and 150 years since the publication of his book, On the Origin of Species. His theory of evolution profoundly changed the way humankind views its place in the world. Yet, despite its overwhelming acceptance by most of the scientific community, surveys constantly indicate large percentages of the population in Western countries have doubts about it. So why does the controversy over origins show no sign of abating? 150 years on, with the benefit of hindsight and the incredible breadth of scientific knowledge now available, how valid are Darwin's ideas today? And what drove his thinking? In the midst of the many films that seek to almost eulogize Darwin this year comes a thought-provoking documentary that asks these hard questions. 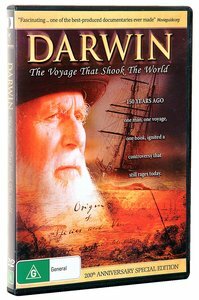 Produced by Fathom Media, a subsidiary of Creation Ministries International, The Voyage that Shook the World contains stunning original footage as it retraces Darwin's historical journey to the Galpagos Islands and South America where they reevaluate some of the icons that helped form Darwin's ideas. Costing over $1 million USD to produce, this made-for-TV documentary also interviews scientists and scholars in Europe and America, including some of the world's leading Darwin historians, on both sides of the controversial debate about evolution. While showing fairness and respect to all, including Darwin the man, the film reveals that even Darwin's admirers have many surprising things to say. The documentary also has period drama reenactments that help the viewer understand some of the influences that shaped Darwin's thinking before he ever departed on his now-famous voyage on HMS Beagle. Renowned US film critic Dr. Ted Baehr (Movieguide.org) called it "one of the best-produced documentaries ever made". Mention the name Charles Darwin and people will get very upset or very enthusiastic. THE VOYAGE THAT SHOOK THE WORLD is an extremely well crafted exploration of who Charles Darwin was and what he believed, released in time for the 200th anniversary of his birth. This fascinating documentary is not a hatchet job or a propaganda piece. Instead, it lets Darwin speak for himself and presents his story through the eyes of professors and others who admire the man. In the process, however, his flaws, confusion and false theories emerge. The beginning shows that Darwin was a very curious boy who was deeply influenced by his humanist grandparents, one of whom developed a whole theory of evolution. As a boy, Darwin also liked to fabricate stories. As a young man, he got the great opportunity to sail around the world. Everywhere he went, he tried to look at the world through the prism of slow geological development. He knew that his position was contrary to the traditional interpretation of the Bible, Genesis and to God. And, he was clear that one could not hold to his position and to the Christian faith. His geological uniformitarianism was refuted by some of the things he actually encountered on his trip. In Chile, he experienced an earthquake and an island off the coast rose 10 feet. Because this cataclysmic change did not fit his worldview, he had to discount it. The scientists who discuss Darwin point out that no one holds to strict uniformitarianism today. We see how the development of Darwin's theory of common descent through survival of the fittest was profoundly influenced by the death of three of his children, his uncomfortable meeting with natives in South America, and some of the evils he saw in nature. Again, today the facts belie some of the foundations of his theory. What the program shows is that Darwin was able to popularize a crude, simple notion. But, even though most scientists are on his side, note that many of his ideas now prove unscientific. About "Darwin: The Voyage That Shook the World"